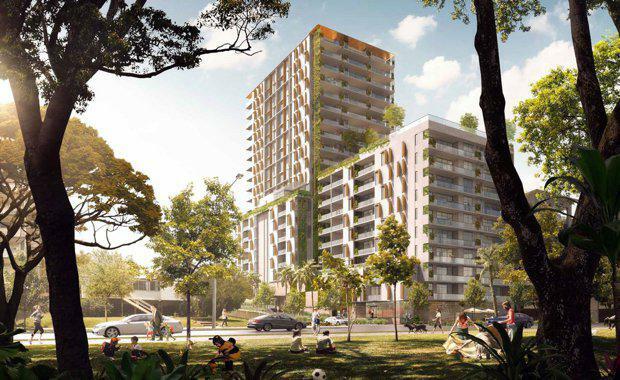 The developer and manager behind Indooroopilly Shopping Centre's recent renovation and expansion has submitted a new development application at 26 Belgrave Road Indooroopilly for two new subtropical designed towers (20 & nine storeys) known as Keating Park Residential. Eureka Funds Management has appointed Hames Sharley as Head Design Consultant for the Henderson Street Residential development which is listed as a component of the Indooroopilly Development Framework. The project includes a proposed new vehicular egress ramp from the existing Indooroopilly Shopping Centre, to alleviate ongoing traffic problems. The proposed ramp is to be enclosed by new residential mixed use development, in keeping with the aspirations of the Brisbane City Council planning scheme.